The pre-eminent art historian and miniature specialist Ralph Edwards declared this to be the finest example of Cornelius Johnson’s miniature portraits known to him. He described it as ‘beautiful…luminous and atmospheric in a rare degree, the modelling is exquisite and the colour has the clear delicacy of the artist’s prime’. Though Johnson is best known for his easel portraits, it was in his small-scale works that he was truly able to shimmer. His skills were undoubtedly best suited to the intimacy of the bust-length portrait, or the confines of the miniature. Interestingly, although Johnson almost always signed his portraits, he did not always sign his miniatures. Karen Hearn notes that our miniature of Dudley, Lord North, is signed ‘C.J.’, and that the form of this signature resembles the one on his little portraits on panel of Charles I’s children. It is conceivable that Johnson himself was particularly proud of his work here. Dr Erika Pohl-Ströher (1919 – 2016); until her estate sale, 2018. London, Royal Academy of Arts, Exhibition of British Art c.1000 – 1860, 1934, no. 963. Paris, Musée Louvre, La peinture anglaise, XVIIIe & XIXe siècles, 4 March – 26 July 1938, no. 303. London, Royal Academy, British Portraits (Winter Exhibition), 1956 – 57, no.127, p.51. Ralph Edwards, ‘Oil Miniatures by Cornelius Johnson’, Burlington Magazine, vol.61 (September 1932), p.131, pl. I.B. Ralph Edwards, ‘Correspondence: Cornelius Johnson’s Miniatures’, Country Life, vol.82, no.2113 (17 July 1937), p. xxxvi. Ralph Edwards, ‘Review: English Miniatures at the Louvre’, Burlington Magazine, vol.72, no.442 (May 1938), p.224. D.B.J. Randall, Gentle Flame: The Life and Verse of Dudley, Fourth Lord North (1602-1677), Durham 1983, p.46. K. Hearn, ‘The Small Oil Colour Pictures of Cornelius Johnson (1593–1661)’, Portrait Miniatures, Artists, Functions & Collections, The Tansey Miniatures Foundation (London 2018), pp.179–188 (illus.). It depicts the courtier, Dudley North, 4th Lord North (1605 – 1677), and relates loosely to Johnson’s bust-length portrait of the sitter at Waldershare Park, Kent. That painting, dated 1627 and enclosed in a feigned marble oval, shows Sir Dudley in a striped silk doublet quite different to the pattern seen here, and with an additional gorget of armour beneath his dropped lace ruff. Our miniature, painted on copper in a tradition well-established for precious and treasured paintings on a minute scale, is an extraordinary testament to Johnson’s skill ‘in little’. Every detail is exquisitely realised, from the sheen on Dudley’s nose, to the pattern of flowers and birds on his blue and white paned silk doublet, and his softly falling hair. From the late 1620s and through the 1630s, Johnson had a significant number of sitters from the principal gentry families of east Kent, including the barons North, and it was during this period that our miniature was painted. Indeed, a number of portraits by Johnson of the North family today form part of the collection of the Earls of Guilford at Wroxton Abbey. Around the same time that Johnson painted the sitter in our miniature, Dudley, 4th Baron North, he was also painted by miniaturist John Hoskins (c.1590 – 1665), (NPG, London), to very different effect. Hoskins worked in watercolour on vellum stuck on to card, which required a completely different technique from Johnson’s preferred miniature medium of oil on copper, as seen here. In 1706, the British writer Bainbrigg Buckeridge described Johnson as ‘an excellent Painter both in great and little’. Karen Hearn observes that Johnson’s miniatures share many qualities with his easel portraits – a refined technique, and a detailed rendition of costume, especially lace. She points out, and speculates that George Vertue was correct in his assumption that Johnson’s procedure was to paint an easel portrait first, often followed by a miniature afterwards. Certainly, numerous examples exist of sitters painted in both formats, with the miniature acting as a kind of ricordo. Dudley was the elder son of Dudley North, 3rd Baron North, and his wife Frances Brockett, daughter of Sir John Brocket of Brocket Hall in Hertfordshire. He was brought up ‘after the best manner’, and on 3 November 1616 was created a knight of the Bath in honour of Prince Charles’s creation as prince of Wales. As a young man he was a self-styled, debonnaire wastrel. At Cambridge, where he matriculated at St. John’s College, he never took a degree, and later reflected in his autobiography that ‘in the prime of my youth I past (or rather lost) some few years at the University’. He was admitted to Gray's Inn on 10 August 1619, but living with his parents at their London house, ‘and having no employment I surfeited of Idlenesse, taking my pastime with some of the most corrupt young men of those dayes’. In 1620, with the rank of lieutenant, Sir Dudley joined Sir Horace Vere’s expedition to recover the Palatinate. Upon returning home in 1622 he registered at the Inner Temple, but soon asked his father’s permission to return abroad, this time as a private traveller touring Italy, Spain, and France, the latter two during the wedding negotiations for Prince Charles. In 1624, returning to military service abroad, he was authorized by Henry Vere, earl of Oxford, to raise troops for the United Provinces. Now a captain, he commanded a ‘Foot Company in our Sovereigns Pay’ in the Netherlands. Our miniature was presumably painted by Johnson around the time that Dudley entered parliament as M.P. for Horsham, Sussex, in 1628. With his flowing hair and fashionable doublet, he is every inch the ‘courtier’, a young bachelor who moved as part of the court elite. It was somewhat later in 1634, that he made a prosperous match with Anne Montagu (c.1613 – 1681), second daughter and coheir of Sir Charles Montagu of Cranbrook (near Ilford, Essex) and his second wife, Mary, daughter of Sir William Whitmore of London. Dudley assured Anne that she could assume herself ‘to bee the person intended’ in his early love poems addressed to a mistress named Serena. The couple went on to have fourteen children, ten of whom lived to adulthood, including six sons: Charles, (eventually fifth Baron North), Francis North (1637 – 1734), Dudley North (1641 – 1691), John North (1645 – 1683), Roger North (1651 – 1734), and Montagu, who became a Levant and London merchant. Having first represented the borough of Horsham, Sir Dudley subsequently sat as member for Cambridgeshire in both the Short and the Long parliaments; he eventually described the latter as ‘that fatal Parliament which set the whole Kingdom on fire’. Long a supporter of monarchy, he nevertheless chose to support parliament to secure the best interests of his family. In 1643, he was ordered to oversee the sequestering of delinquents’ property, and was even put in charge of collecting money from the county of Cambridge for the purchase of pistols and armour for Cromwell’s regiment. He acted as a justice for Ely and Suffolk, concerning himself with local problems such as ‘tippling’ [drinking], gaming, and swearing, and for a time after 1653 he even performed civil marriages. In spite of the austerity of the Commonwealth, the Norths all the while retained the trappings of their courtly tastes, keeping a resident composer (notably, John Jenkins), and a considerable library. On 5 June 1660, Sir Dudley petitioned the newly restored Charles II for a pardon, which was granted on 3 September. He reached his mid-sixties before his father died and he himself was summoned to the House of Lords in 1667. Having suffered much from the ‘stone’, North died on 24 June 1677 at Kirtling, and was buried privately on 27 June in the chancel of Kirtling church. Johnson was the British-born son of Dutch émigrés in London, though his great-grandfather haled from Cologne. In 1622, when he married Elizabeth Beck (or Beek), herself from a Dutch migrant family based in Colchester, he was living in the London parish of St Ann, Blackfriars. Blackfriars was popular with immigrant craftsmen of many different trades, because it was outside the jurisdiction of the guilds of the City of London. Johnson would therefore have been part of a mutually supportive incomer community there. Throughout the 1620s, Johnson was clearly extremely busy, producing portraits for an increasingly important client base. He must have begun to run a workshop, with assistants, although we know nothing about how this operated. On 5 December 1632 Johnson was appointed Charles I’s ‘servant in ye quality of Picture Drawer’, and the king seems to predominantly used Johnson to make small-scale royal portraits, either on wooden panel or in his speciality medium, oil on copper, occasionally even including miniature copies after Van Dyck’s images. Indeed, earlier the same year, Anthony van Dyck had arrived in London and had begun to work for Charles I, who had knighted him on 5 July, and had appointed him ‘principalle Paynter in Ordinary to their Majesties’. As Charles’s official painter, van Dyck was, of course, expected to settle there. However socially and professionally ambitious Johnson may have been, the overwhelming success of Van Dyck must have presented him with a considerable challenge. Indeed, later in the 1630s, Johnson can sometimes be seen discreetly adopting and adapting van Dyckian compositions and postures in his own work. Van Dyck died in December 1641, which should have re-opened opportunities for the artists in London whom he had elbowed aside. However, the political situation was deteriorating, and the King and Court left London early in 1642. 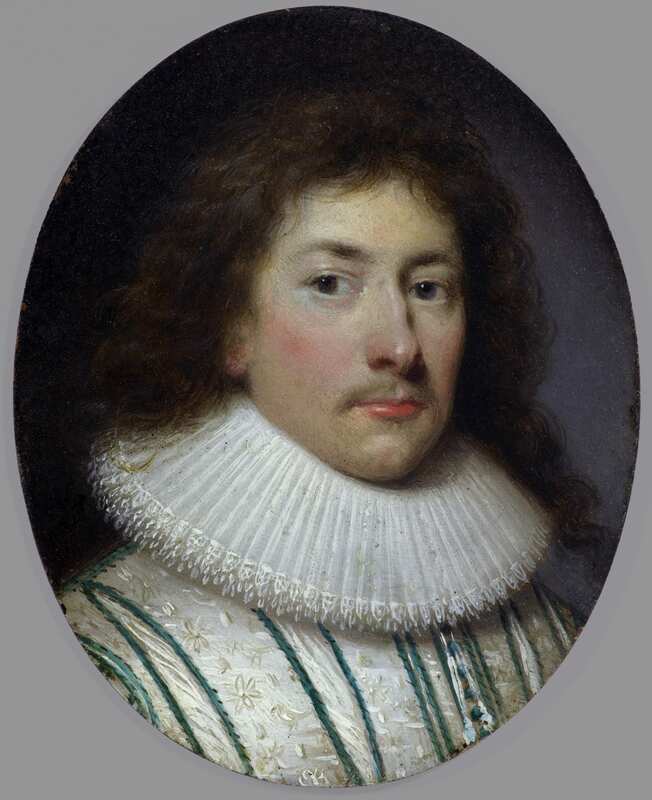 In October 1643 Johnson and his family emigrated to the northern Netherlands, where his career had a second blossoming, as a leading portrait painter until his death in Utrecht in 1661. Twelve people carried his coffin, indicating his final wealth and status. From 1931, our portrait miniature was in the collection of Sir Leonard Twiston-Davies (1894 – 1953), an eminent collector and philanthropist with Welsh roots. He lived at Rockfield Park, Monmouth, and was High Sheriff of Monmouth, a member of the county council, was a justice of the peace and chairman of the Council for Social Services for Wales, as well as being an F.S.A.. Sir Leonard was treasurer of the National Library for Wales, and president of the National Museum of Wales. The feigned marble cartouche was Johnson’s preferred choice of setting at that time, as though placing his sitters quite literally in stone for posterity. Johnson, along with the English artist William Larkin, was one of the earliest proponents of this format, mimicking the miniaturist tradition of painting portraits in oval. K. Hearn notes that in Johnson’s miniatures there is often ‘a gleam to the tip of the nose’, in ‘The Small Oil Colour Pictures of Cornelius Johnson (1593 – 1661)’, op. cit., p. 180. The engraver George Vertue recorded that Johnson lived for a time in Bridge, near Canterbury (though he must have retained his home in Blackfriars too) – ‘[Johnson] lived sometime in Kent…[and] painted pictures fore several Gent. Familyes thereabouts….done mostly in the years 1630 & to 40.’ See Karen Hearn, ‘The National & Professional Identities of Cornelius Johnson’, Cornelius Johnson: Painter to King and Country’, The Weiss Gallery, 2016, p.13. See K. Hearn, ibid., p. 179. See K. Hearn, ibid., p. 183 – 184. D. North, Observations, sig. A3v–A4r. See: Dictionary of National Biography on-line, ibid. D. North, Observations, sig. A4. See: Dictionary of National Biography on-line, ibid. Randall, 128. See: Dictionary of National Biography on-line, ibid. D. North, Observations, sig. A4v. See: Dictionary of National Biography on-line, ibid. In January 1625, Johnson took on John Evoms.as an apprentice, and in April 1638 another (unnamed) apprentice joined him. According to George Vertue, Johnson’s nephew Theodore Roussel worked with him for nine years; see Hearn 2015, op. cit., pp.17, 18, 45.